The site search at Mahalo is ok, but we’re starting to out grow it. We need a really robust system for people finding the pages we have on Mahalo. 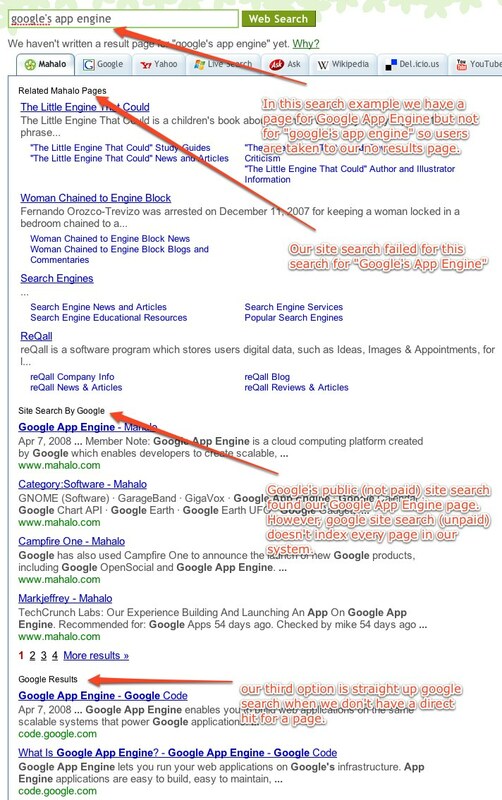 right now our own editors tend to go to google and use the “site:Mahalo.com” operator to find stuff, but that is flawed because Google only indexes a certain percentage of our pages. We could like to have one great site search followed by Google… we just need to figure what that one great site search is. Google’s new paid site search: anyone ever use it? What are the best hosted options for site search today? What are the best software solutions that we can install on our servers? Wikipedia’s site search seems much better. Anyone have thoughts on their solution? What companies solve this problem for corporations? * Yes, I’m in education mode right now because Mahalo the product is in the middle of an eight week facelift where we are updating all the Guide Notes to 300 words and putting citations in them. Whenever we get into a major work session like this I have to leave the editorial team alone to do their work. When that happens a CEO is left with a big chunk of free time. It’s hard when you’re the the CEO to leave people to their work, but sometimes you have to. So, when that happens I like to drill down into areas where I think my knowledge base is weak. Thus the buying traffic best practices post last week, and my sudden interest (on the gillmor gang last week) with all things EC2 and Google App engine.